I can appreciate the hope and sentiment of this piece, but a hundred years later and several genocides, apartheid, and other such atrocities make me think the author was a bit too generous in how long this process this would take. 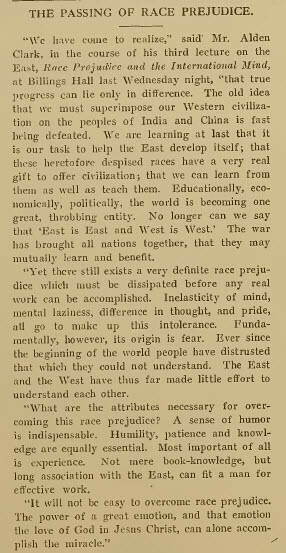 It is interesting to see this sentiment so early in the 20th century though: "The old idea that we must superimpose our Western civilization on the peoples of India and China is fast being defeated." However, it seems to me that the final line, "The power of a great emotion, and that emotion the love of God in Jesus Christ, can alone accomplish the miracle." gives away the game. First, it calls upon a miracle, rather than people to do the hard work. Second, by enshrining this goal of defusing racial prejudice (solely focused on the "East"--nevermind internally) in Christianity, it clearly ignores the religious differences intertwined in the many different cultures of the "East."